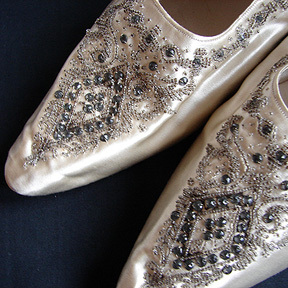 A lovely pair of fine kid leather shoes with a highly embellished and ornate design. 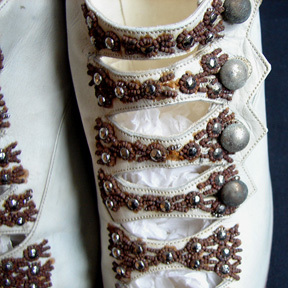 Fine crystal beads are worked around the elaborate cut-out decorations, with glass milk-white buttons near the scalloped edge. Made in Canada, the shoes have a Louis heel and pointed toes. A lovely pair of shoes. Superb design and beading on this very beautiful 19th C. bag. 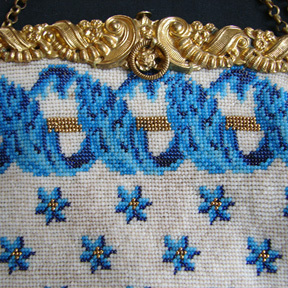 Lovely colors, with assorted shades of blue and turquoise beading with gold beads worked in the design. Lovely scattered flower florets are further enhanced by the elaborate scrollwork at the top. A very ornategold clasp completes this beautiful bag. Circa 1910, the label says "Sorosis, custom made in USA by A.E. Little SC". A fine pair of ladies pointed shoes with Louis heel and heavilly embellished with rusted cut steel beading. The scalloped edges have additional larger grey beads at the side. Highly decorative, shoes like this are quite rare to find. 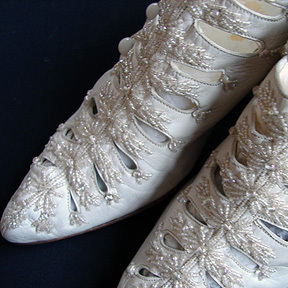 Circa 1890's-1900, a lovely pair of fine cream silk pointed shoes with Louis heels, that are embellished with rhinestones and tiny crystal beads. The shoes were probably part of a wedding ensemble or for evening wear. A elegant pair of shoes with a tasteful and refined design that is extremely beautiful. The inner lining has also been entirely lined in silk. A beautiful and rare pair of shoes! A lovely silk taffeta clutch bag with beautifully worked beavais embroidery, the design of large roses and leaves is quite lovely. The bag is lined with orange taffeta, and there is a small purse and mirror inside. In good condition. Simply stunning! 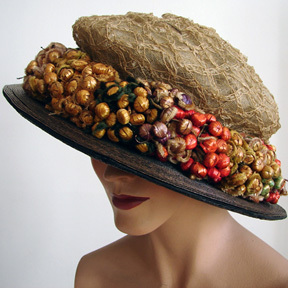 A superb Titanic era straw hat sold by "Curtis" of New York, the hat has a elaborate straw and net latte design surrounded by a massive amount of straw berries and flowers. This hat came with a collection of hats made in France, so it is possibly French and sold by "Curtis", New York", or it could be the designer. A wonderful hat in good condition. 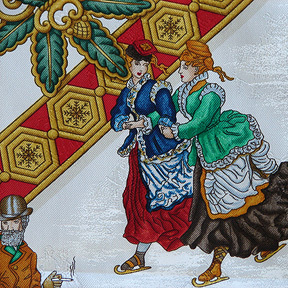 Lovely Silk Hermes Scarf "Brise De Charme"
Designed by Julia Abadie for Hermes in 1990, the scarf has a lovely design of assorted fans from different periods. There are lace fans and designs with swans, peacocks, etc. A wonderful item for the collector. 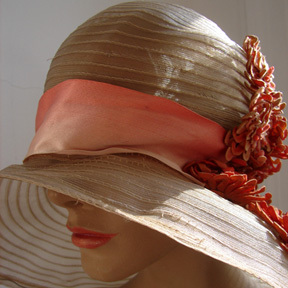 Circa late 1800's-early 1900, this hat came with a French label "Maison Pouyanne, 4 Rue De La Paix, Paris". 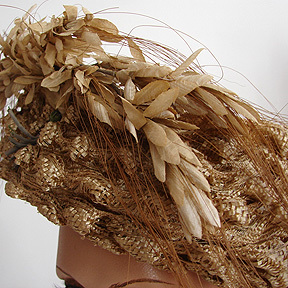 The hat has a lovely design, three dimensional design of raised ridges and is embellished with large plume of wheat like flowers. 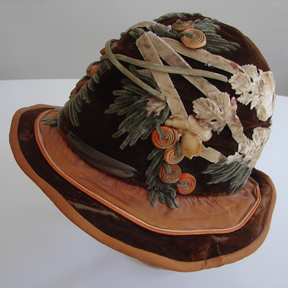 The inner narrow case had a silk-chiffon lining which is damaged, but the hat is in very good condition. 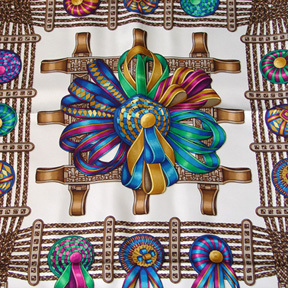 Vibrant Hermes Silk Scarf "Les Rubans Du Cheval"
A beautiful design on this silk Hermes scarf, with dazzling jewel-tone colors. The scarf comes with it's original box and the silk has the signature of the designer, "J. Metz". 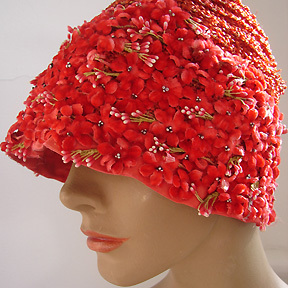 A luminous orange straw cloche hat with masses of tiny velvet flowers. The label reads "S and Co. Beth Hats". THe inner silk lining has some wear otherwise good condition. 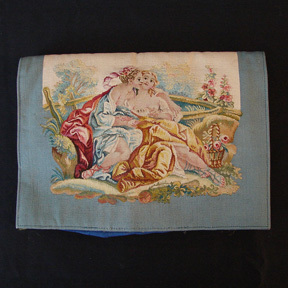 A lovely design on this Aubusson purse. The purse has two figures in a pastoral scene, and on the back there are two birds surrounded by a garland of flowers. The inside is covered with water-marked silk. Early part of 1900's, a lovely gauze hat with silk ribbon and velvet flowers. Elegant and refined, both in design and quality of work. In good condition. A elegant handbag by Artcraft Studio in New York. The shape and design are excellent, with marcasite and semi-precious stones on the handle. The rich heavy satin has ruching at the bottom. Measuring approximately 6 1/2" by 9" across. A wonderful silk Parasol! The quality of silk is superb, and the opulent carving on the handle is extremely well done. 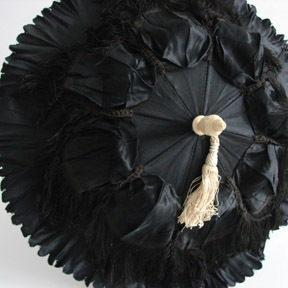 The parasol has fringe and brading between the raised silk. 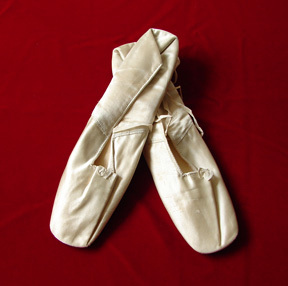 In very good condition, the inner cream silk lining has damage. 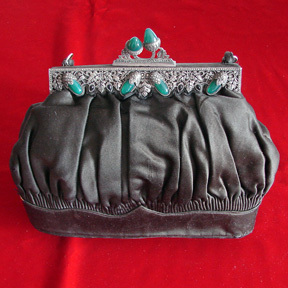 A beautiful French evening bag with elaborate Cloisonne handwork, beadwork, and figilree work. 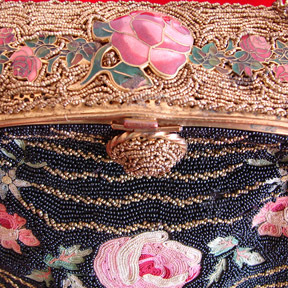 The bag is encrusted with small beads and fine embroidered roses. Measuring 7" by 9 1/4" across widest part. In good condition. Circa 1920, a stunning period hat with a very ornate design of three-dimensional flowers and leaves. The design is profuse, with cut velvet and large leaves. 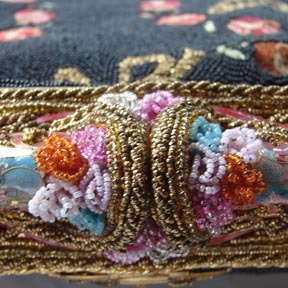 There are rolled fabric flowers that have gold embellishments, and narrow velvet ribbons that weave through the design. A very beautiful beaded bag with an eloborate beaded and cloisonne clasp. 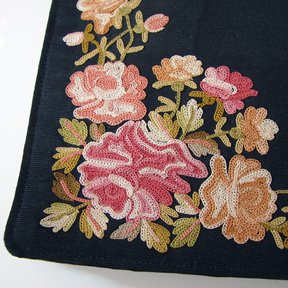 There are fine petit-point roses, with beaded bows on both sides of the purse. A stunning purse! 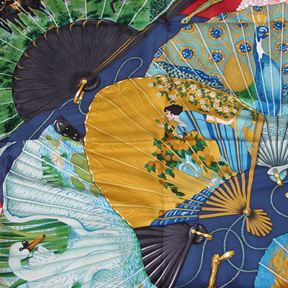 The scene on this silk jacquard Hermes scarf is quite lovely. The theme speaks of the joy of winter, "Jois De Hiver". Wonderful vignettes, ladies and gentleman skating, all enjoying the glorious winter. The scene colors are vibrant, and the design magical. 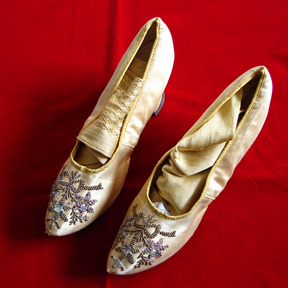 A beautiful pair of golden silk ladies shoes with matching silk stockings. Embellished at the front with a design of bows and flowers, worked with jewel toned beads. The stockings have a woven design running through them. Elegant and beautiful, a rare set! Some light minor wear, mainly good condition. A lovely pair of pearlescent cream silk satin "slippers" with leather soles. 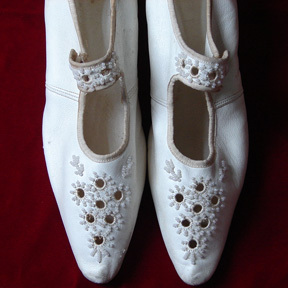 Due to their fragility, silk slippers were generally worn for evening wear. They are in very good condition, some small light age stains. The leather soles indicate that these were hardly worn. 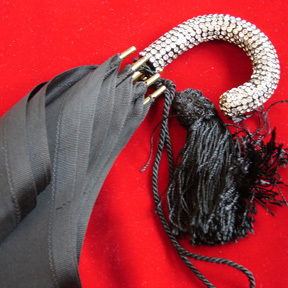 Circa 1930, a gorgeous umbrella with rhinestones on the handle and also at the tip of the umbrella. The umbrella has brass inner fixtures. In very good condition, with only two missing rhinestones. The umbrellas seems hardly used and has its original case. A pretty pair of ladies shoes made of the finest calf leather. A pretty open cut design is embellished with small beads. There is some staining on the heels and the inner part of the shoes. The shoes need to be cleaned. 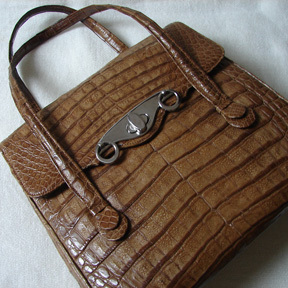 A elegant "Comtesse" handbag with a striking silver clasp that works very well against the taupe colored alligator skin. 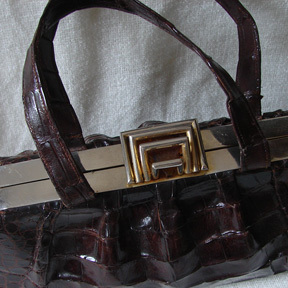 A stylish handbag that is mainly in good condition. Two very small openings, one on the edge and one on the back strap. Measuring approximately 10" by 11". A lovely crodadile handbag that has a glowing sheen. The Deco style clasp has a bakelite or plastic amber stone that adds a special finishing touch to this bag. The inner lining is brown suede and in good condition. The handbag is mainly in very good condition, there are some wear areas on the straps that need to be seen to, and one spot on inner lining. Measuring apprx. 15" by 6" at deepest part. 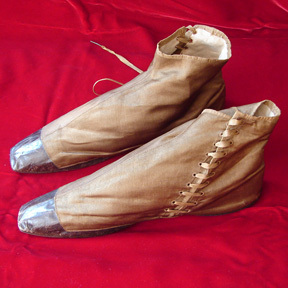 A wonderful example of ladies footwear produced during the early part of the 19th Century. The combination of cloth and leather is quite charming and there is also a handwritten signature of the owner or maker of the boots. The condition is very good, with only some scuff marks on the leather. The boots have been well preserved. Measuring approximately 10" long. Circa 1900, excellent quality of embroidery on this bag. It has a large rose bouquet on the front and single rose surrounded by a garland of flowers. An ornate clasp with golden stones and ruched silk inner lining complete this exceptional bag. A tiny oxidation mark on one corner, and one very small split on the back edge. Otherwise the bag is in very good condition. 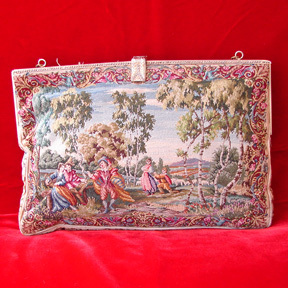 Fine work on this lovely figural Petit-Point bag. Made in France or Austria, with a design of courting gentlemen and ladies surrounded by lush landscape, flowers, and ornate scrollwork. 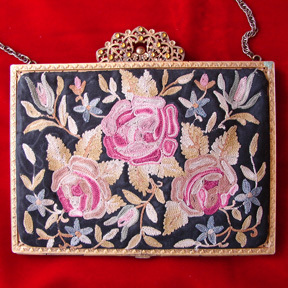 A marcasite embedded frame completes this special bag. The inner apricot silk lining has some light staining. The bag is in very good condition.